After a long, hot summer, our St. Louis weather has apparently decided to skip fall and head straight for winter. That’s just fine, as I am more than prepared for the return of winter beers. One of my favorites will be back this year, Ferguson’s Mocha Stout, but this year the brewery is mixing it up bit, promising us that this version will look a bit different from previous releases. “We will once again be partnering with Foundation Grounds in Maplewood for our coffee, but this year’s base beer will be thicker, and slightly higher in ABV than last year,” said head brewer Rob Abell. Last year Ferguson made two versions of Mocha Stout, regular and mint, but this year they’re adding a second variant, an Orange Mocha. These variations will come on as other seasonal selections run out, so there will be no guaranteed release days, just yet. Plans to add Cider to the brewing menu continue to develop. While the brewery awaits the proper licensing to come together, they are busy lining up recipes so they are ready to go. “I am already thinking about 2019, and am happy to say that we will have a new beer school every month of 2019,” said Abell. Not a single subject will be repeated, January will be different from February and so on. There will be one session per month of no more than 30 students. 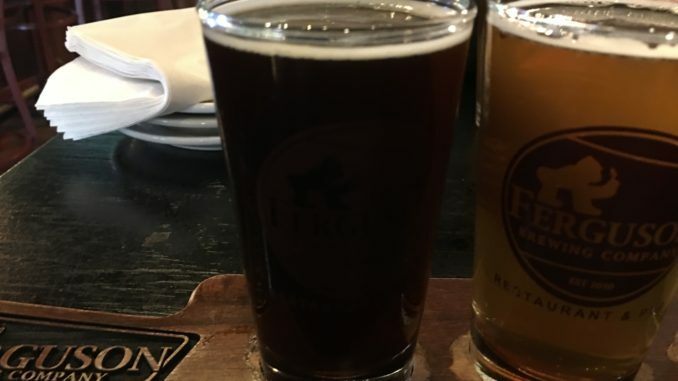 Beer school will include a flight of beers, some light food pairings, and each month will feature a small batch that can only be sampled at the beer school. The small batch will tie into the theme of that month’s beer school. They should have a full schedule and information about purchasing tickets before the holidays.